Fuses are essential elements which protect both home and car stereo amplifiers from damage. Fuses are designed to blow if the stereo amplifier receives too much voltage, as the result of a short in the system or an over-voltage surge by the car's electrical system. If your stereo has quit working, check the power supply for your home stereo by unplugging your home stereo amplifier and connecting another electrical appliance to the outlet. If it works, you probably have blown a fuse. To test your car stereo amplifier, use a voltmeter or test lead to check the power cable leading to the car stereo amplifier. If it has 12-volt power, you may need a new fuse. If the fuse on your stereo amplifier has blown out, be thankful that it has sacrificed itself to protect your amplifier. Disconnect the amplifier from its power source by unplugging it in the case of a home stereo amplifier, or disconnecting the power cable at the battery end in the case of a car stereo amplifier. Take out the damaged fuse. 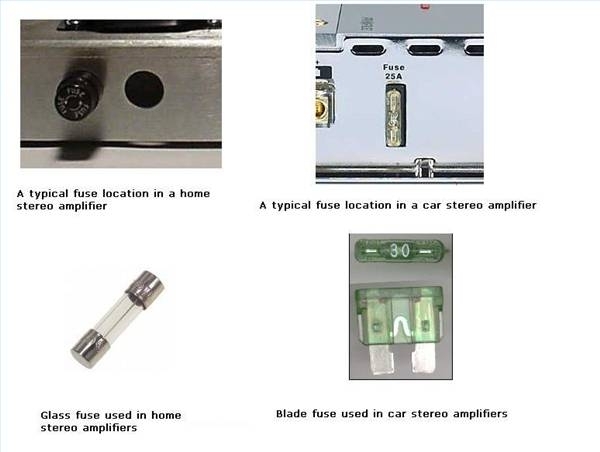 Car stereo amplifiers use "blade" style fuses that are inserted into the chassis of the amplifier at one end of the unit--usually the end where the power cable goes into the amplifier. Pull out the blade fuse of a car stereo amplifier with your fingers. Hold onto the plastic part that is sticking out of the chassis and pull towards you. If it's difficult to remove, use a pair of needle-nosed pliers to pull it out, repeating the process of grasping the plastic portion that's sticking out of the chassis and pulling it towards you. Some amps use more than one fuse--pull them all out by repeating this process for each individual fuse. 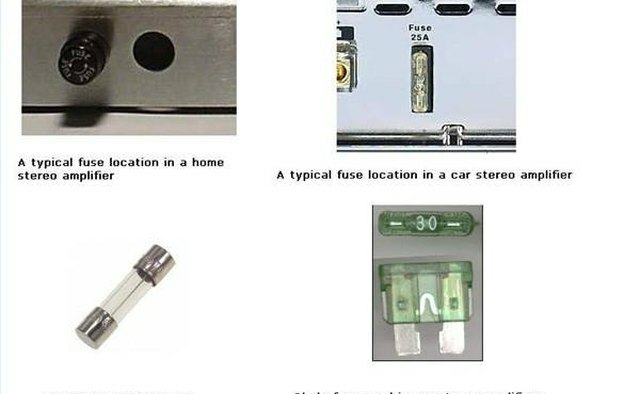 Home stereo amplifiers usually use a "glass" fuse located in the rear of the chassis. Twist the cap holding it in and remove it--the fuse will pop out. You won't need to pull it out with any special tools. Examine the fuse. First be sure it is blown. Hold the fuse up to the light and examine the metal strip or wire inside the plastic or glass casing. If the wire or strip is broken, the fuse is blown. Examine the fuse for its amperage rating. This will be on the end of the fuse, and will be a number, usually in multiples of 10--such as 20 or 30. This is the size of fuse you will use to replace the blown fuse. Insert your new fuse into the chassis of the amplifier. Push the fuse in so it sits firmly in the fuse socket in the case of a car stereo amplifier. For a home stereo amplifier, insert the fuse into the hole and replace the cap by twisting it on to the right. Reconnect your amp's power supply and test operation. If the fuse blows again, consult with a audio expert or repair person as to the possible cause.